"An Introduction to the General Art of Drawing" by Willem Goeree. Full text. In 1668 Willem Goeree (1635-1711) published an influential treatise on drawing, Inleydinge tot de Al Ghemeene Teycken-Konst. In comparison to the treatise of Leonardo which it borrows from, it contains an unusually large amount of technical information about drawing materials and techniques. It also deals with interesting practical matters of learning and teaching drawing, that other treatises don't touch upon. The book in Dutch was republished and reworked several times and translated to German and English in the 1600s and later. I also find bits and pieces of its text used in numerous other drawing manuals and treatises (e.g. Salmon, de Piles, Jombert) without a mention of Goeree's authorship. I have transcribed and posted the 1674 English translation keeping the original spelling. 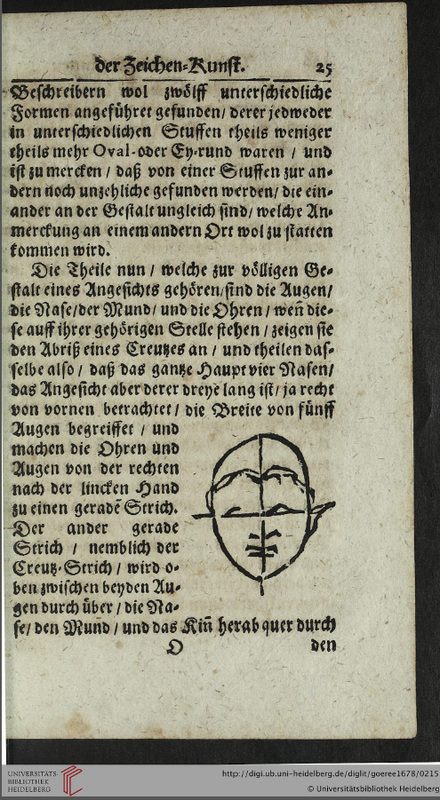 There are three illustrations in the text. I substituted them with corresponding plates from editions of Goeree publicly available on-line. This English translation also contains many plates at the end that I haven't included because of their copyright status. These plates don't appear in Goeree books in Dutch or German. They represent the traditional drawing book repertoire: eyes, noses, mouths, hands, feet, faces, and whole figures, most of them rather unrefined copies of well-known drawing book prints (I could recognise Fialetti, Palma il Giovane, Reni, Cousin, maybe Bloemaert and Guercino; others I have not yet identified). I've done this project on my own and without feedback, so I will appreciate any comments, corrections, suggestions and any other input. I would also be happy with a greeting from anyone who studies this subject. The first Beginning of the Art of Drawing. The first beginnings are about some particular Members. Faces subject to most changes. What the Oval doth signifie. Reason wherefore this Cross in the Oval is not understood of the young Learner. Means to understand to draw with judgment all manner of faces. The profit that comes by the manner of this instruction. Of those things which in every degree of the Art of Drawing are necessary to be observed. How to place a picture. The beginning of a Draught. You must assure your self of every stroke. With patience your must overcome your passions. The Actions must appear as first in your scetzing. To use care, thus in drawing a Schetz neater, that you lost not the action. Confer your draught with your principal. Faulss (as soon as seen) to correct. You must sometimes behold your work with a fresh eye. How it comes to pass that we better discern faults. Of the things which in the third Step, viz. in Drawing after Plaister-Rounds, or Embossed Works, are necessary to be observed. Of the anatomie, or Knowledge of the inward and outward forme of the Humane body, concerning Muscles and Motions of the Arteries. Means to exercise themselves herein. From the Books go to the life. Not to make all Muscles. In what part you must observe your Muscles most. Fat bodies have small Muscles. Fair bodies must not be muscled hard. In what parts the most changes are incident. Of those things, which in drawing after the life, are necessarie to be observed and understood. The natural Life reacheth all things. Divers manners to set the Model in action. In all actions Members must make a Compact together. What Principally is to be observed in the good actions. Examples of four footed beasts. The good Position Of a figure. Out of the tending of the Members to see what doth the figure. The manner how to sit to draw. You shall not look too much, or imitate anothers Draught. What is to be observed commonly. The Model shall not stand too long in his action. Of the several sorts of Chalks and Crions for the Use of Drawing, and upon what they are to be used. Black lead good for to scetch withal, principally for Masters, that are sure in their drawing. Of the General and his Parts, and how they must be understood and observed. What Parts and Generals are. Parts also have a generality in themselvs, altho' they are Part to the general. Likeness of things dwelleth most in the general. And in this respect that this Art of Perspective doth consist in certain lines, which appear to foreshorten and diminish all things which we behold with our eyes, and to the same (as to a particular study) many demonstrations and figures are necessary, we have nevertheless resolved to pass them by, in regard there be several Books written, even of great and famous Masters, viz. The Works of Serlius, Marelois and Vignola; or de Vries, the Lord de Sargus and Boss; and principally that most famous work of the Learned Jesuit, but a little while since set forth in our English Language, in which is taught the Fundamentals of Perspective, out of the Geometrical square or Platform, to bring all things thorow a Geometrical square foot in Perspective; and to do the same also by the same means in Arches, and roofs of Churches, unto whom I will recommend all Learners, and go forward with our Art of Drawing; but in regard that most Learners at their first begining may be too young, and know not how to apprehend those things compleatly, yet shall the Master as soon as possible open the Learners eyes, and teach him the Art of Perspective, and that the Learner together with the Art of Drawing, might also learn to know and understand the Art of Perspective also. The beginings then in the Art of Drawing, are first about the knowledg how to draw some particular members of the bodies of men, viz. 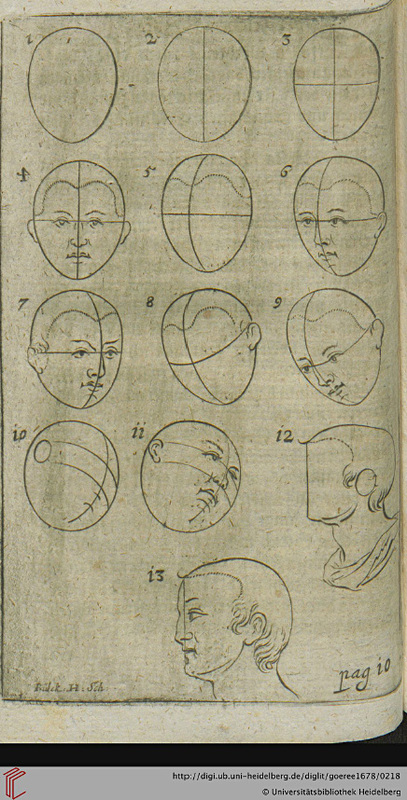 Heads, Faces, Armes, Hands, Legs, Feet, &c. of which there are many Copies extant in Print, which also with profit for the first begining is best to be used principally for to learn how to draw a face or head thereby, being subject to most changes, and there we will instruct the Learner, first of the Oval, with his several changes and variations, and of the Cross in the same, because the Learner may learn to understand the better all bowings and returnings, reclinations and inclinations of all sorts of faces, according to the Examples at the End of this Book. Now it is necessary, that in short they are instructed in this, viz. that the Head in general has the form or shape of an Egge, and therefore according to the Latin is called Ovale; the things belonging to such an head or face, are the eyes, eye-brows, nose and ears; and that they may have their due situations and places, comes to pass by means of the Cross thorow the Oval. 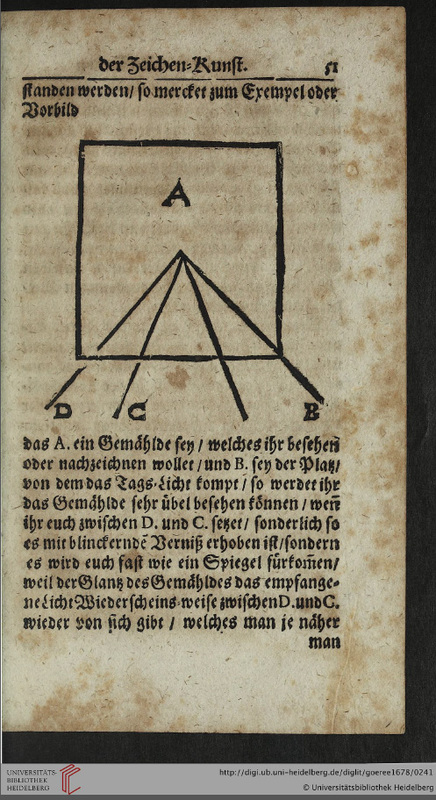 Thus the perpendicular in the Oval being divided in four equal parts, makes the whole head to be four Noses in Height, but the face only of three noses; and the diameter crossing the perpendicular is divided into five equal parts, each being the bredth or wideness of one eye, and this Diameter is the ocular line wherein the eyes are to be placed, and therefore a streight line is to be drawn from the top of the right ear, thorow both eyes, to the top of the left ear, and from above thorow the midst of the Nose, Mouth and Chin is drawn the whole line which is called Perpendicular crossing the Diameter or ocular line at right angles, which together is called the cross of the Oval, upon which cross then (let the face turn which way it will) the eyes, nose, mouth and ears must be placed in their due and proper places, as in this face foreright you may observe. in respect it is observed that many Masters commit errors in the same, either thorow ignorance or neglect, not taking due observation of the change of the cross of their faces, which fault in a Master is the bigger, because it is the first A B C in a Learner. then turn the Oval from the left hand to the right a little about, then the streight Perpendicular of the cross shall change and stand bent like a bowe or arch, as is to be seen in the Figure 5. 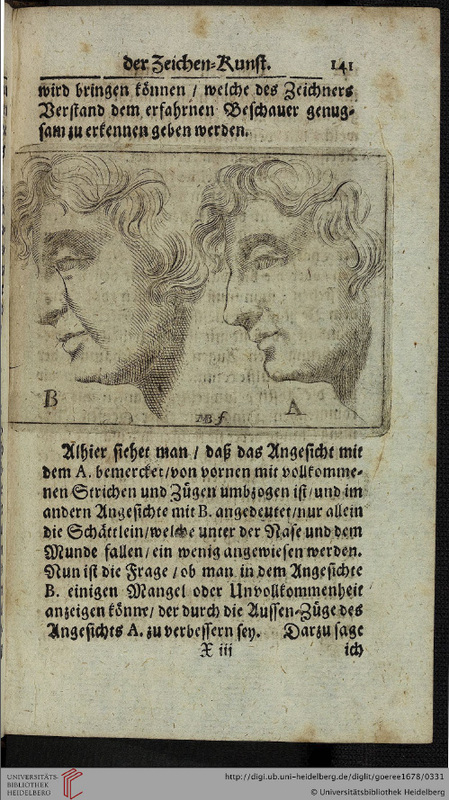 (except those that come side-ward, which commonly are directed, or thought to be drawn by means of a Perpendicular, as to be noted in the figure 12. upon which Perpendicular, Forehead, Nose, Mouth and Chin, are drawn as you may observe in the figure 13.) let them be of what manner soever. Nevertheless, this is easie and less subject unto errors. for it is not always certain, that good Masters are also always good instructors or Teachers; but happy is that scholar that finds both these qualities in a Master, nevertheless, teaching with judgement is most necessary and profitable to the learner; the great Mastership must come afterwards out of the Practitioners own industry and natural inclination. of that I will say nothing in particular, for that which is necessary in drawing after a Draught is also necessary in drawing after a Picture; and because not to make a Repetition of one thing twice; I will pass it by here, and speak of it in its place, where I shall speak of drawing after Pictures. Having then a Picture to draw after, put the same in a Place of good light, so that the flickering of the Glass of the Colours doth not hinder you; and for to finde that place, place your self (if possible) so that your eye together with the light of the day, runs to the Picture. Make choice of a reasonable distance, according as the Picture is big or small, at least so far of that with the opening of your eyes you may behold the whole Picture at once, for the greater your Picture is, the further off you must sit to draw after the same. Put your Principal right before you. Here it is to be noted, that when you draw after a Draught or Print, you must put the same strait or right before, even as you do a Picture, and you must not lay the same flat down before you, for then you behold the things presently to foreshorten; in the same manner shall your Paper (whereupon you draw) use five or six times double upon a Pannel-board, keeping the same in your lap, and with your knees elevate the same as high as possible; thus shall the thing you draw stand before you upon one end: and after this manner you shall observe the better whether your draught be like unto the Principal, which otherwise (your Draught lying flat before you) you should not see, by the reason aforesaid. to make one good Draught, then a hundred without observation; you must strive with more pleasure to draw, then to have drawn, that is, rather to desire to be doing then to have done. It is also not impertinent sometimes for one hour or two to lay by his drawing, and to recreate himself in somewhat else, whether it be in reading, or looking upon some good Prints, which doth stir up the spirit for to go on again in his drawing, and to behold the same with eyes unfatigable, and it shall oftentimes come to pass, that you shall espie many faults in your work, which before you could not possibly observe? the reason is that as then we behold our work as if it were another bodies work never by us seen before, and then our eyes easily espies some fault or other, which we take up presently, ex contrario, because we behold our work from the beginning; thereof comes a Custom to the eyes to behold the things of such former shape which hinders that the faults are not easily perceived by our understanding. The truth of this you may easily conceive by daily experience, for example, if we see a new fashion of cloathing, which we conceive to be not fashionable, or not becoming, and which many times is contrary to reason it self, then can we presently espie the faults, and disprove what we dislike in the same, but when this fashion begets a custom, so that for a long season we have had this fashion before our eyes, then we, in stead of an exception, take a love to it, and covet for the same, so that the same thing which before we found great fault withal in beholding it with our eye, now with great pleasure as a brave and a fine thing begin to behold the same. Therefore assoon as you shall espie a fault in your Drawing, amend the same presently, and tarry not, until a custom (as is said before) come to your eyes. This rule you shall observe in all manner of Drawing, be it after Prints, Draughts, Pictures or Plaister-figures, yea, after the life it self, where conveniency and place will allow and permit the same; this then being well observed, then you shall proceed to a sure and judicial circumferent stroke, to shading and finishing of which, (when we come to speak of finishing) I shall shew divers ways and manners.